On a college campus, it is not often that you hear fond recollections of middle school dances. It is even more seldom to hear these dances being discussed in tandem with bruschetta. However, when the twenty young chefs descended upon the Carleton campus, these topics temporarily became the greatest points of conversation. SInce it was the last week of young chefs of the term, we decided to give the middle schoolers a change of scenery by inviting them to Carleton. The field trip began with a scavenger hunt around the Carleton campus. Students divided into two teams and each given a list of clues for locations on the campus. These stops included the café, center for civic and community engagement (where much of the work for young chefs is done), the library and math center. At each location, they received one ingredient which would be incorporated into the mystery food that they were going to cook at the end of the hunt. Playing to their competitive sides, we made it a race between the two teams to get to the end. The students were thrilled by this aspect and insisted on sprinting to every location. Though they were hurried, to say the least, in transit between the stops, they slowed down considerably to appreciate each location. At the café they were amazed by the array of bake goods and speculated what it would be like to have so many options available on a daily basis. 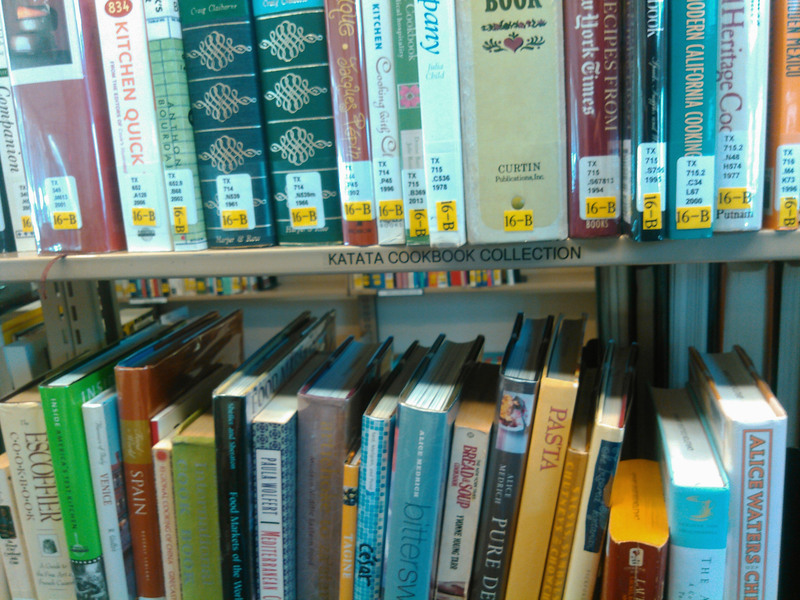 In the library, they got to see the recently added cookbook section. Each grabbed a cookbook off the shelf and poured through the recipes, gawking at the different dishes. The differences in the cookbooks sparked conversation about the differences in cuisine across the world. 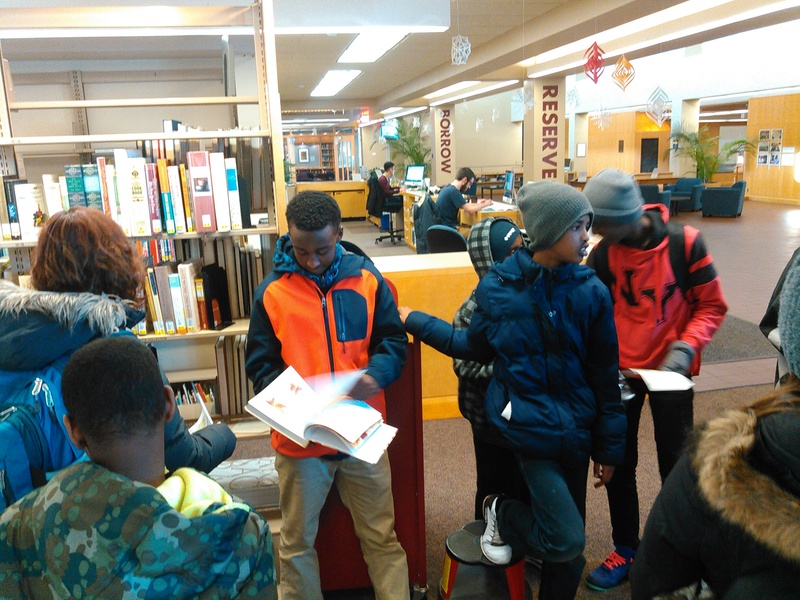 Before progressing from the library, they were faced with the ultimate challenge– utter silence while walking through the first (silent) floor of the library. The scavenger hunt culminated in the biology building where the students got to tour a lab. As they walked by the equipment, we had casual conversations with them about what different machines do. After concluding the scavenger hunt, we headed to a kitchen to make use of the the bread, tomatoes, onions, mushrooms, and herbs that that they had collected. The students predicted that we would be making sandwiches, which wasn’t too far from the truth. We were actually having a lesson on bruschetta which was their “next guess”, even though they weren’t entirely clear on what bruschetta was. As a group, we made four different types of bruschetta– one was with pesto and red peppers, another with caramelized onion, sautéed mushrooms and goat cheese, a caprese type and a dessert bruschetta with mascarpone, blackberries and a mint simple syrup. With the help of volunteers, two or three students worked on each of the different components of the bruschetta. When everything was prepared, each student made one of each type and was challenged to do so in a way that was aesthetically pleasing. There was no universal favorite, but all were well liked. Furthermore, the kids loved tasting and comparing the cheeses used. Though there was no structured scientific component of the lesson, it was apparent that they had begun to take the connection between food and science to heart. As we cooked they posed questions about why onions make people cry and the nutritional value of different components of mushrooms. Though slightly chaotic at times, overall it was extremely fun to give the students a slice of our life and see all the energy and joy they carried in exploring. Perhaps more significantly, it was incredibly rewarding to see the impact of the program in sparking voluntary discussions and genuine curiosity about science, food preparation and the intersection of the two.